At first specimen this looks like a series of holes drilled into a small, smooth substrate (like Trypanites), but then you notice that the substrate has grown up around the holes, and on the far left you can make out two cones. These are cornulitid tubes that lived on and then inside a living stromatoporoid sponge. Jonah Novek (’13), a Wooster geologist graduating tomorrow, found these in the Hilliste Formation (Rhuddanian, Llandovery) during his Independent Study work on Hiiumaa Island in Estonia. My Estonian paleontologist friend Olev Vinn is the expert in bioclaustrated (embedded in a living substrate) cornulitids, as you can see from the papers listed below. These fossils are an excellent example of endosymbiosis, or the living relationship of one organism embedded within the skeleton of another (see Tapanila and Holmer, 2006). We can’t tell yet without a thin-section, but the cornulitid here is probably very similar to the Sheinwoodian (Wenlock) Cornulites stromatoporoides Vinn and Wilson, 2010. The specimen shown above is already in the mail to Estonia for further analysis. 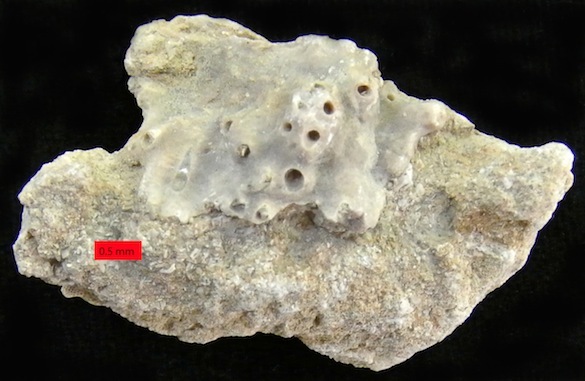 This specimen is the earliest example of cornulitid endosymbiosis in the Silurian. 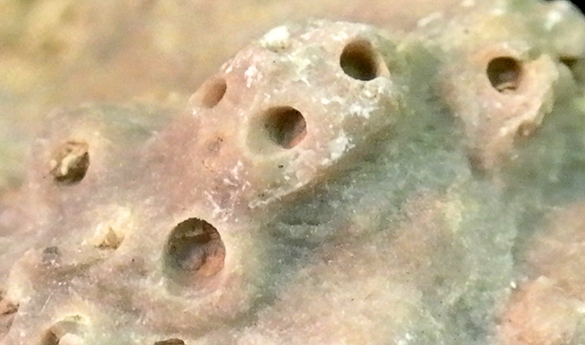 A closer view of the embedded cornulitid tubes. The tubes in these holes appear to have dissolved away, at least in their distal parts. Some of the details of the stromatoporoid substrate are just visible. Fond memories of the 2012 Wooster-Ohio State University expedition to Estonia. 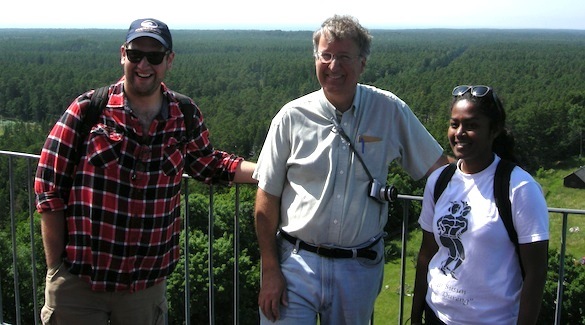 Jonah Novek (’13), me, and Richa Ekka (’13) on the top of the Kõpu Lighthouse, Hiiumaa Island, Estonia. Photo by our friend Bill Ausich (OSU). Congratulations to Jonah on his find, and best wishes to all the senior Wooster Geologists on this graduation weekend. Tapanila, L. and Holmer, L.E. 2006. Endosymbiosis in Ordovician-Silurian corals and stromatoporoids: A new lingulid and its trace from eastern Canada. Journal of Paleontology 80: 750-759. Vinn, O. and Wilson, M.A. 2010. Abundant endosymbiotic Cornulites in the Sheinwoodian (Early Silurian) stromatoporoids of Saaremaa, Estonia. Neues Jahrbuch für Geologie und Paläontologie 257:13-22. Vinn, O. and Wilson, M.A. 2012a. Encrustation and bioerosion on late Sheinwoodian (Wenlock, Silurian) stromatoporoids from Saaremaa, Estonia. Carnets de Géologie [Notebooks on Geology], Brest, Article 2012/07 (CG2012_A07). Vinn, O. and Wilson, M.A. 2012b. Epi- and endobionts on the Late Silurian (early Pridoli) stromatoporoids from Saaremaa Island, Estonia. Annales Societatis Geologorum Poloniae 82: 195-200.